Homeprovements is a family run business that specialises in all your Home improvement needs. One main area of your home that you don’t want to let get out of hand is your waterproofing and general maintenance of the exterior of your home. We at Homeprovements are the go to company for all of your waterproofing needs in Johannesburg. We offer all types of waterproofing solutions and we don’t make use of any sub-contractors. We are a fully self-contained company with over 25 years of experience in the waterproofing industry in and around Johannesburg. We make use of waterproofing membrane, tanking systems and damp prevention solutions. For all your rising damp, general damp, parapet walls, underground wine cellars etc waterproofing, Homeprovements are the contractors you want to make use of for the best results and all workmanship is guaranteed. We work in and around Johannesburg and our teams are fully skilled in the art of waterproofing. We do all waterproofing using membrane bandages and membrane coating over the problem areas. Specialising in damp/water proofing of underground cellars. *We also recommend that all gutters are cleaned of all leaves and other debris atleast every 6 months to ensure gutters are working correctly and avoid water blockages which cause water to gush back into the roof, damaging the ceilings, walls etc. Vertical and horixontal damp proofing. 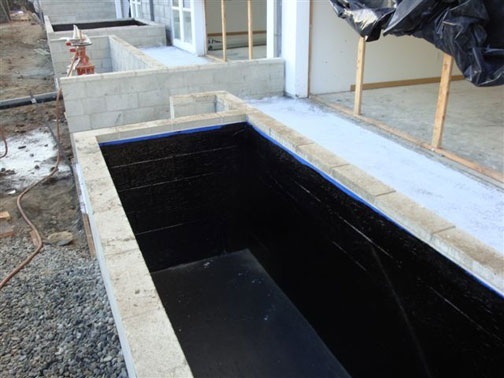 We have a waterproofing tanking system that has been tried and tested for years with outstanding results!